What is fast food and why is it so popular? Fast food refers to food that can be prepared and served quickly. It can come from many places: sit-down restaurants, take-out, drive-thru, and delivery. 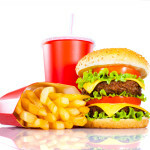 Fast food is popular because the food is inexpensive, convenient, and tastes good. However, fast food is often made with cheaper ingredients such as high fat meat, refined grains, and added sugar and fats, instead of nutritious ingredients such as lean meats, whole grains, fresh fruits, and vegetables. Fast food is also high in sodium (aka salt) which is used as a preservative and makes food more flavorful and satisfying. People also often drink soda when they eat fast food which adds “empty” calories (calories that do not make you feel full or provide nutrients) to the meal. It’s helpful to remember that with fast food, moderation is important. Choose foods that are broiled, steamed or grilled instead of fried. For example, pick a grilled chicken sandwich instead of fried chicken or chicken nuggets and steamed vegetables or fresh fruit instead of french fries. Choose soups that are not cream based. For example: If the name of the soup includes the word cream or chowder, such as “Creamy Tomato Soup,” choose something else such as broth-based soup like minestrone or chicken noodle. If you’re getting a side such as french fries, order a small, or kid sized portion. Never supersize anything; these options pack in an even larger amount of calories and fat. Sit down while you eat. Fast food is known as a meal on the go. Many people eat in their cars or while doing another activity. If you are distracted, you may not pay attention to how much food you are eating, and you may eat much more than you need. Sit down at the restaurant you visit and pay attention to your meal. If you can’t sit, eat just a little and save the rest for later. That way you won’t be starving once you have the chance to sit and finish your meal, and you’ll be less likely to overeat.